Would somebody please get some mattresses to Albany, New York? Stat. Quite honestly, I’m getting sick of the whining. We heard it last year, and now again this year. 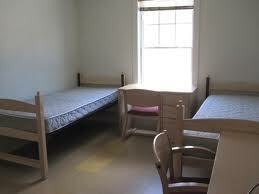 Apparently the New York Football Giants are “not impressed” with their sleeping arrangements at training camp. And honestly, I don’t blame them. The last time I slept in a dorm room bed was my freshman year at Syracuse. And thankfully, I didn’t spend much time in it. No…dirty minds! I was up late most nights partying, I mean…studying…alright partying. But I don’t think I could spend one night in one of those beds now and not come out crippled the next morning. And I’m 5’8. I won’t tell you how much I weigh, but it is considerably less than a linebacker. A couple hundred pounds less. Tight End Martellus Bennett, for example, is listed as 6’6 and 270 pounds. Not even one of the bigger guys on the roster. Alright, Goldilocks, we get it. But players are reportedly complaining of back trouble and a few have even been treated for it. And we’re talking about the NFL World Championship football team! These guys brought home the Lombardi trophy and we can’t get them some decent beds? If the Indianapolis Colts were complaining about the beds in Anderson, Indiana…I’d tell them to buck up (get it?) after last year’s 2-14 season. Sorry boys, I love you, but it’s true. You know what I would do if I owned a furniture store in New York? I would deliver a truckload of new mattresses to Giants camp in Albany. Or at least 52. Let the rookies and the guys on the brink of making the roster sleep in dorm beds. But Eli Manning, the two-time Superbowl MVP? And the rest of the guys who won two world championships in five years? No way. Get them pillowtops. ASAP. 52 mattresses (wholesale)…approximately $26,000. Delivery and setup…$5,000. The Boys in Blue as your free company spokespeople…priceless. Calling…Macy’s. Just think, they could take the entire Giants football team, dress them up as the Serta sheep, with their numbers on their butts, and walk them in the Thanksgiving Day parade. Can you imagine how adorable Eli would be? Bet Olivia would be taking pictures. Bet a lot of people would be taking pictures! Superbowl XLVII, sponsored by Serta. This entry was posted in Giants, NFL and tagged Eli Manning, Martellus Bennett.